To mark 40 years since the end of London Country RLHs on the 31st July 1970, a mini-running day based around Addlestone will take place. RLH 23, RLH 32, RLH 48 and RLH 61 are planned to run over old route 461, providing a thirty minute interval free service for a couple of hours in the afternoon between Staines and Walton. They will pass the site of the former Addlestone Garage, where many RLHs were based (including RLHs 23, 32, 44 and 48 at various times). They will also pass the site of the former Weymann works, where all the RLH bodies were built before being equipped with chassis from AEC at Southall. 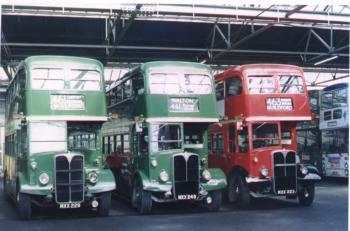 It also happens to be just over 60 years since the first RLHs were entering service in 1950 (RLHs 7 to 14 working from Addlestone garage at this time). RLH 44, now converted into a Control Bus numbered 581 J, will make a duplicate with the last journey from Walton, arriving back at Addlestone at 15:26 to recreate the final London Country RLH service, which was by the very same vehicle on the 461A (but late at night originally!). The above are timing points. Buses will also stop at any other bus stop en route if hailed or the bell is rung. Please note there will not be a printed programme available (in advance or on the day) so please print off this page for your reference. Trips are subject to traffic conditions and vehicle availability. They are provided free of charge and are not part of local bus service networks. Passenger admission cannot be guaranteed. Sorry but prams, buggies and pushchairs cannot be carried. Buses will not enter Staines bus station, or stop for photographs at the low bridge. Please do not eat or drink on board. Be careful when boarding or alighting from these open platform buses. Photographers, please do not delay departures. Event organised by Timebus with the support of the private vehicle owners R. Proctor and Ensignbus. Please visit by public transport. According to the SWT web site as at 15th July, there is fortunately no planned engineering work affecting services to the below stations. Staines has direct services to London and Reading. Walton and Weybridge are on the south western main line. There are no trains via Walton or Weybridge running to Addlestone and Chertsey; services from that branch terminate at Byfleet and New Haw. From London it is faster to reach Chertsey and Addlestone via Staines. There are no local bus services on Sundays at most of the stops our buses will use.